When it comes to checking accounts, ours are pretty exciting. At Grow, we think giving you a choice of accounts is pretty cool. Each account is made for the way you manage your money. There’s Checkless Checking.1 Yes, checkless. And CashBack Checking,2 which is exactly as awesome as it sounds. But those aren’t the only surprises. Both accounts come with a Grow Visa® debit card and free services like more than 70,000 surcharge-free ATMs across our network,3 free mobile and online banking, and free direct deposit. Our checking pays you! First, you’ll earn a little dividend, and an extra 5 cents with every qualifying swipe of your Grow Visa debit card. Plus, get another $2 back every month when you set up Grow installment loan payments (auto, RV, motorcycle, watercraft or Signature loans) for automatic withdrawal from your CashBack Checking account. Checking without checks? We have the technology! Checkless Checking offers a simple, basic way to keep track of your spending, without checks or non-sufficient funds fees. 1To be eligible for a Grow Checkless Checking Account, you must receive one monthly deposit via direct deposit, ATM deposit or mobile deposit, and complete a minimum of five Grow Visa debit card transactions each month. Qualified Visa debit card transactions include signature or PIN- based point-of-sale purchases, bill payment transactions made with your Grow Visa debit card, and online purchases. Excludes ATM withdrawals, deposits and transfers. Failure to meet all monthly requirements will result in a monthly service charge of $5. No NSF (Non-Sufficient Funds) fees will be charged on this account. To avoid overdrawing your account, transactions will be declined and returned unpaid when you don’t have sufficient money in your account. You cannot use paper checks on this account. 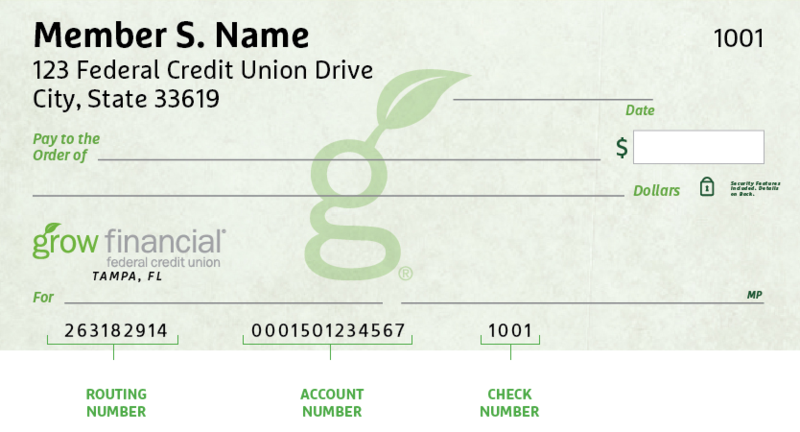 Any check written will be returned unpaid, even if you have sufficient money in your account. 2Earn a bonus of $0.05 per qualifying Grow Visa debit card transaction. Qualified Visa debit card transactions include signature or PIN based point-of-sale purchases, bill payment transactions made with your Grow Visa debit card, and online purchases. Excludes ATM withdrawals, deposits and transfers. To be eligible for the $2.00 monthly bonus, you must have a scheduled automated recurring loan payment from your Grow CashBack Checking to your Grow Financial consumer loan, within the same account number. Online bill payments are excluded. Eligible loans are auto, motorcycle, watercraft, RV and the Signature loan. If the loan is past due 30 days or more, the bonus will not be paid. All bonuses will be credited to the Grow CashBack Checking on the last day of the month. Fees could reduce earnings on the account. Grow CashBack Checking is a variable rate account. The Annual Percentage Yield (APY) is 0.01%. The APY may change without notice after the account is opened. The APY quoted is effective as of 10/04/2017 and may change without notice. 3There is no fee for transactions made at ATMs in the Grow Financial, CU24/CU HERE or CO-OP networks. Transactions from non-network ATMs will carry a $2.00 service charge, in addition to any fees charged by the operating institution.